When I decided to write God Loves You. 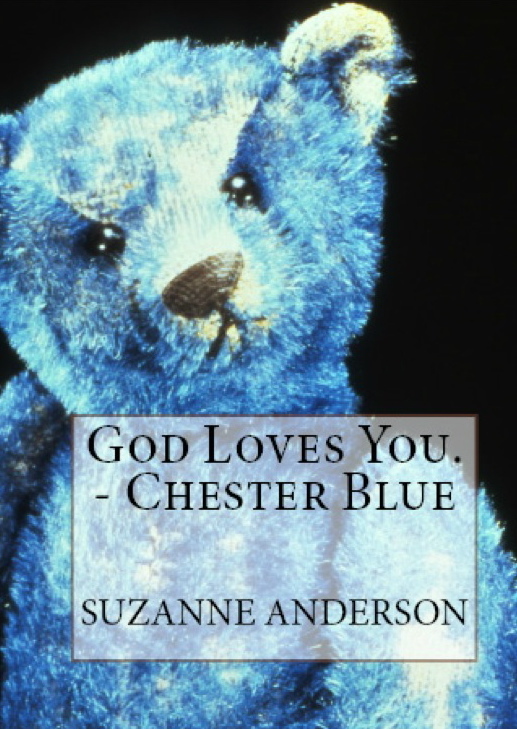 – Chester Blue, it wasn’t because I had a burning desire to write a children’s book. 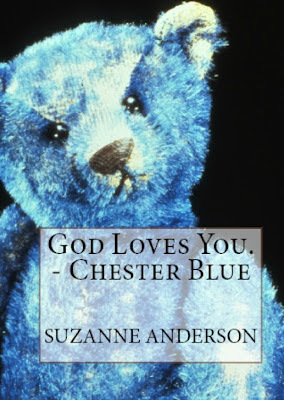 It was because Chester Blue, the blue teddy bear, modeled after the first teddy bear I sewed myself, needed a story to be written about him. Second, at the time, I was fascinated by stories about inanimate characters that ‘just appeared’ bearing mysterious messages. In the case of this story, crafting the message was easy: I wanted something inspirational. If this was to be a message that appeared out of the blue, than why not make it an encouraging message from God? So, I had the character, I had the premise (what if you received a message from God, just when you needed it most?) the question was, who was my audience? It seemed obvious that Chester Blue would appeal most to children. After all, who would better relate, than a child, to a blue teddy bear magically appearing carrying a message from God? How would writing a book for children differ from writing for adults? Would I have to change my writing style? Were there specific dos and don’ts that I needed to adhere to? The first answer is that I only asked these questions after I’d written the first draft of my book. And I think that’s very important. I believe that it is so easy to get caught up in the mechanics, the ‘how to’, of creating the story that you research the thing to death and never get around to writing or worse, completing, your book! Once I’d written my story, these questions sent me off to one of my favorite hometown haunts, our public library. There I spoke with one of our incredibly knowledgeable librarians from the children’s section. She walked me through the rows of books and piled my arms with children’s books that would become my teachers. The two books that had the greatest impact on me were The Miraculous Journey of Edward Tulane by Kate DiCamillo, and The Heavenly Village by Cynthia Rylant. What I learned from Kate DiCamillo was that you don’t have to write ‘down’ to children. Yes, the concepts and perhaps even the plot lines will be simpler, but the language can be as rich and textured as any novel for grownups. This is absolutely the case in Edward Tulane, which is so beautifully written that it can be enjoyed equally by children and adults. Cynthia Rylant’s Heavenly Village taught me that children’s books can deal with difficult topics, such as death and the afterlife, if treated with gentleness and respect. Cynthia Rylant is a master of both in her beautifully written book that treats a scary topic with love and even the occasional laugh. The lesson learned, which I believe would apply to writing for the first time in any genre is this: write your story. Then take the time to read from the masters of your genre to see how expected touchstones are handled with skill and experience. The combination of both will lead to a satisfying story for your readers. I hope I’ve accomplished that in God Loves You. – Chester Blue.